As inshore waters begin to warm significantly in June, doormat action generally shifts from inside the bays to out in the ocean or sound waters. Photo by Tom Schlichter. Without a doubt the 2018 fluke season has gotten off to a fine start. 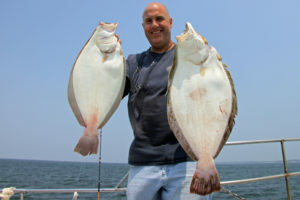 With water temperatures still relatively cool, big fish have stayed shallow, offering the chance to catch the doormat of a lifetime in bay and nearshore waters from New Jersey to Massachusetts. No doubt, they’ll still be plenty of keepers taken from the bays and harbors this month but action with the biggest summer flatties is likely to shift to ocean waters over next few weeks. In fact, as we went to press, the season’s first consistent action with summer flatties was getting underway at Montauk, down along the south shore of Long Island, and a cross the way at Sandy Hook, NJ, so it looks like the shift is already underway. With just that thought in mind, here’s a bevy of tips on connecting with June’s ocean doormats – the size guaranteed to draw double-takes when you finally get back to the dock. Long, thin strip baits, like this one cut from the white side of a legal fluke, are super bait for doormats in June. Photo by Tom Schlichter. In addition to ocean waters, deep bay and sound waters produce outlandish fluke during June. Photo by Tom Schlichter. 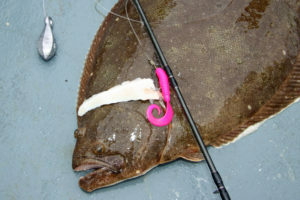 Using larger baits is one way to entice big fluke while discouraging smaller ones from biting. That’s common knowledge among fluke fans these days but there is more to this theory than simply loading up the hook. The mistake many anglers make when using larger baits is not allowing the fish enough time to get those big offerings swallowed deep enough for a sure hook set. Keeping in mind that ocean waters may still be a little cool through mid-month, it’s important to “let ’em chew.” Rather than set the hook as soon as you feel a bite, free-spool several yards of line when you sense a strike. You can then re-engage the reel, allow the line to come taught and gently lift the rod tip to see if there is any additional weight at the end of your line. If so, continue the rod lift – adding a little bit more snap – to drive home the point. 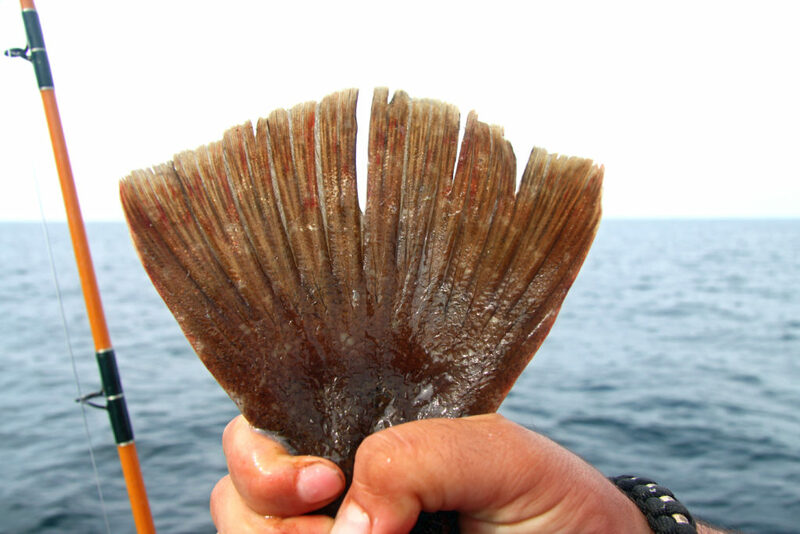 As for what kind of bait to use, squid strips work just fine but bunker, bluefish and mackerel strips are also worthy of consideration, especially if any of these species are in the area. Don’t go crazy on the size thing. Large baits should be pennant shaped and measure six to ten inches long but keep the strip width to no more than one inch wide at any point. It’s the thin width of a well-presented strip, I think, that really turns on the biggest fluke. While wide, heavy strips tend to bunch up on the hook and often spin at the end of the line, slender strips dance enticingly as you drift along making them appear much more life-like. Slicing the last two inches of the strip at the narrow end provides even more flutter. All strip baits, including those cut from squid, should be hooked only once – through the wide end – so they ride straight out behind the bend of the hook. If you want to tip your strip bait, opt for a single large spearing or smelt. Small fluke and even mini-doormats can be quite aggressive, often following baits and multi-hook rigs with plenty of bling right to the surface in shallow water. Big doormats in deeper water, on the other hand, tend to exercise more caution making a slow, natural presentation your best bet. Therefore, it is probably a good idea to forego the use of bright and shiny spinners, chrome fluke balls and all the bells and whistles that are designed to catch anglers as much as fish. There is a time and place for all the adornments later in the season as water temperatures climb and competition in the shallows between smaller fluke and mid-sized keepers grows intense. For this ocean game, though, you’ll want to keep things clean and simple. If you want to add a little something to try and catch a doormat’s interest, slide one or two red, florescent pale green or pearl colored beads onto the leader so they rest tight against the hook eye. This subtle addition can make a big difference when the water is slightly discolored. The pale green beads work especially well from Shinnecock Inlet east up into New England waters while pearl or red beads see to provide an edge in waters further west – or anyplace bunker are highly visible. 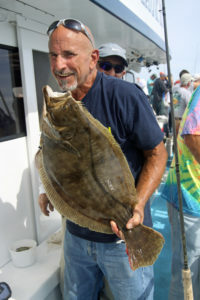 Tony Raffo of Howard Beach, NY drilled this fat doormat aboard the open boat Miss Montauk. Photo by Tom Schlichter. There are times when big fluke are known to feed most heavily – fish them seriously. Most large fluke are caught at the beginning and end of moving water. Some monsters are also taken during slack tide, much to the chagrin of those who choose the quiet water period to enjoy their lunch. In general, the biggest fluke are least likely to expend a lot of energy when chasing food. Thus, they tend to hunker down during the strongest periods of current and feed more freely as things settle down. Mid-tide is fine for targeting ordinary keepers and smaller fish but if you want a spring doormat, work the end stages and slack water. Traditionally, the top of the flood and beginning of the ebb are the best times for big spring keepers. I love to use light tackle for fluke fishing, but it’s just not practical for greeting newly arrived fluke in ocean waters. Deep-water probing means dealing with stronger currents and more sinker weight to hold bottom and keep your baits in the strike zone. Put aside the 12- and 14-pound class spinning sticks and opt for a conventional set-up spooled with 20- to 30-pound test monofilament line or 30- to 60-pound test braid. Choose a fairly stiff rod with a tip that can handle 4 to 10 ounces of lead. If you plan to fish in water deeper than 40 feet, braided line gets the nod over monofilament. Keep in mind that early season fluking in ocean waters can run a bit on the picky side. With fewer hook-ups in general, but a better chance at tempting a doormat than later in the year, you’ll need to make the most of every strike. A stiff set-up allows you to set the hook with leverage, feel the bottom in strong currents, and handle a surging doormat if you get lucky. Take no chances where gear is concerned – beef up and be ready. With miles and miles of open water ahead as you power out of the inlet, there’s a tendency to be overwhelmed when it comes to choosing a spot to drop your lines. Most skippers simply look for the fleet, pick a lane and drift along with everyone else. A better idea is to check your charts and target specific areas where you think the fluke might stack up on their inshore migration. Instead of making long drifts over nothing but sandy bottom with little in the way of depth changes, try to isolate an area on the charts that shows sloping depths or a little bit of rough bottom and concentrate on working it with shorter probes. Reefs, for example, are doormat magnets as the bottom hugging predators patrol the edges of submerged rubble in search of crabs, bergalls and other small cellar dwellers. The slopes leading into and out of troughs are another excellent choice, as are the fringes of shoals located in 40- to 80-foot depths. Any significant slope is also worth a try as it allows you to sample the action across varying depths over a short period of time. Hook more than one fish at any particular depth and you have a good idea of water depth you should target.